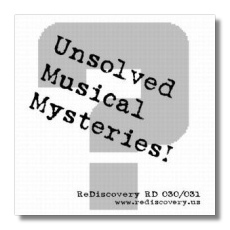 Classical Net Review - Unsolved Musical Mysteries! Gioachino Rossini: Overture "The Siege of Corinth"
There was a time when the average American could score points when company came over for at least displaying a token interest in classical music. That's not to say that we all were insincere phonies, just that having a few classical LPs on the shelves made us feel and look intelligent and cultured. There also was a time when stereophonic sound was new, and Americans with new "hardware" were eager to have cheap "software" to play on it. Enter classical LPs you could purchase in supermarkets or in discount department stores. Typically selling for no more than a couple of bucks, these LPs featured items from the standard repertoire in stereophonic sound, and with performers whose names were suspiciously familiar… but not quite. (Sometimes no performers were listed at all.) The labels included Spin-O-Rama, Rondo-lette, Palace, Acorn, and Crown. Amleto Toscali, Igor Koussevsky, Karl Reiner were three of the conductors you might find on these labels, although it is safe to say, given their suspect names, that these gentlemen never really existed. Back then – and it's still true today – a foreign name was equated with a more authentic performance, and so much the better if the name resembled the name of a great musician who really did exist (Amleto Toscali/Arturo Toscanini, Igor Koussevsky/Serge Koussevitzky, Karl Reiner/Fritz Reiner, etc.) To put the icing on the cake, the new stereophonic technology was given fanciful names, and equally fanciful claims were made about it. The Design label, for example, touted "ASP," which stood for the "Authentiphonic Stereo Process," whatever that might be. Suffice it to say that Mercury's Living Presence and RCA Victor's Living Stereo processes were not knocked out of court by ASP! The CD era had its equivalent of such releases, but "supermarket LPs," although no longer available, still retain their charm for a certain sort of collector. The ReDiscovery label has periodically dug up some of these recordings, cleaned them up, digitally remastered them – with results that often are sonically invigorating – and sent them back out into the world for the renewed amazement and edification of collectors old and new. (Here, the Bizet and Handel works are taken from reel tape masters; the remainder of the program is taken from LPs.) Furthermore, ReDiscovery (and others) have done their research, and in many cases it has been possible to identify who the pseudonymous performers really were. Many of these recordings were made in Europe by good musicians who are remembered by collectors even today. The recording conditions might not have been ideal – limited rehearsal and retake times, odd microphone placements, etc. – but the results often were spontaneous and characterful (if sometimes rough), which is more than one can say about many "big name" recordings today. This first volume in ReDiscovery's retrospective opens with a mostly compelling performance of Tchaikovsky's Violin Concerto. The Acorn LP identified the violinist as "André Herbern," accompanied by "Hans Lille" and the "Société des Concerts Orchestra." It appears that the real performers are violinist Janine Andrade, with Hans Jürgen Walther and the Hamburg Radio Symphony. Most of Andrade's playing is meltingly lovely, and if she seems underpowered at times, that can be blamed – at least in part – on the original engineering, which inflates the orchestra and sticks it in an echo chamber. This performance need not take a back seat. Don't expect authentic performance practice in the 12 selections from Messiah. "Kurt von Baum" and the "Homburg [sic!] Symphony" give the music a healthy Victorian spin, although not with a massive chorus. The vocal soloists are not unidentified, which is just as well, except for the contralto, who does a great job in "O Thou that Tellest." The chorus is enthusiastic, and the conductor very flexible – some might say wayward – in his approach to tempo. I am unsure about foreign accents from any of the soloists or the chorus; my guess it that they are English. The real conductor is one J. Randolph Jones. The overture to The Siege of Corinth leaps right out of the speakers. This is an unsubtle performance of an unsubtle piece, and I found it very enjoyable. The pseudonymous performers are conductor "Peter Haas" and the "Amsterdam National Symphony." It has not been possible to identify the real performers, but they have nothing of which to be ashamed. Surprisingly, the Carmen Suite seems to have been recorded by Paul Paray and the Detroit Symphony Orchestra, not by "Cyril Holloway" and the "Hampshire Symphony Orchestra." Assuming the conductor really is Paray, he gives the music a characteristically conscientious and stylish workout. The Tchaikovsky Piano Concerto #1 is really exciting. "Wilhelm Strauss" turns out to have been pianist Sondra Bianca – a classy player whom ReDiscovery has remembered on other reissues. "Igor Koussevsky and the International Symphony Orchestra" really are the Hamburg Philharmonic (or Philharmonia, or Radio Orchestra) under Hans Jürgen Walther. Bianca and Walther have interesting ideas about how this music should go, and I confess that there were parts of the first movement which made my hair stand up on end (in a good way!) although I reckon I can hum this concerto in my sleep by now. The engineering is pretty good, although the stereo separation is exaggerated. This musical mystery tour closes with a rough-and-ready performance of the 1812 Overture conducted not by "Karl Reiner" but by Hans Jürgen Walther. (The orchestra is correctly identified, it seems, as the Hamburg Philharmonic.) The brass have bad moments, but the performance spits fire, and I was not bored, as I can be with other recordings of this work. Here we even get some cannons – probably dubbed in later. Amusingly, we are given one last cannon shot after the orchestra has finished, as if to say, "Take that, Napoleon," or perhaps, "Take that, Mr. Tchaikovsky." As with other ReDiscovery issues, these are no-frills CD-Rs, although the otherwise minimalist booklet makes interesting reading – kind of like a detective story. The asking price for the set of two discs is just $15, which includes shipping and handling. ReDiscovery CDs can be purchased from their website: www.rediscovery.us.